Along with a handful of other American TV movies of the 70’s and 80’s, this bold, disturbing tale of pre-pubescent madness is the kind of thing that triumphed over the tight restrictions of the medium to scar any impressionable kids who stumbled across it. Dennis Weaver and Valerie Harper move with their family (including Granny Ruth Gordon and son Oliver Robbins, who was in POLTERGEIST the same year) into a large country house, attempting to recuperate from the death of their oldest child a year earlier. Failing to pay heed to the house number (13666!! 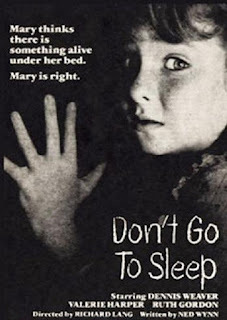 ), they are soon beset by creepy moving dolls, premonitions, beds spontaneously catching fire...and a series of strange “accidents” seemingly caused by the restless spirit of the deceased daughter. The most chilling thing to ever include the name Aaron Spelling in its credits, this is an unerringly creepy picture, from the persistent, eerie lullaby-like musical motifs to the kind of relentlessly grim plotting rarely found on U.S. TV. In a refreshing twist on expectation, the film’s portrait of a grieving family incorporates a credibly unbalanced little girl while making Harper the strong, angry one who derides her husband for descending to the level of a weepy drunk in the face of tragedy. It is also host to what might be American television horror’s harshest moment of the era: young Robbins fatally plunges off a roof before we cut cruelly to a shot of a shattered watermelon hitting the floor elsewhere. Stylistic flourishes, also untypical of TV films of the time, enhance the impact, notably the slasher-like, extended subjective shot of a mysterious presence wielding a pizza cutter all the way up the stairs, and the circling camera that entraps us in a cell at the very end when the film confirms that a simple ghost story has become a deeply disturbing tale of juvenile insanity. The climactic twist itself is as bleak as they come, revealing the family we have just rooted for having been enormously complicit in the event that resulted in their child burning to death.